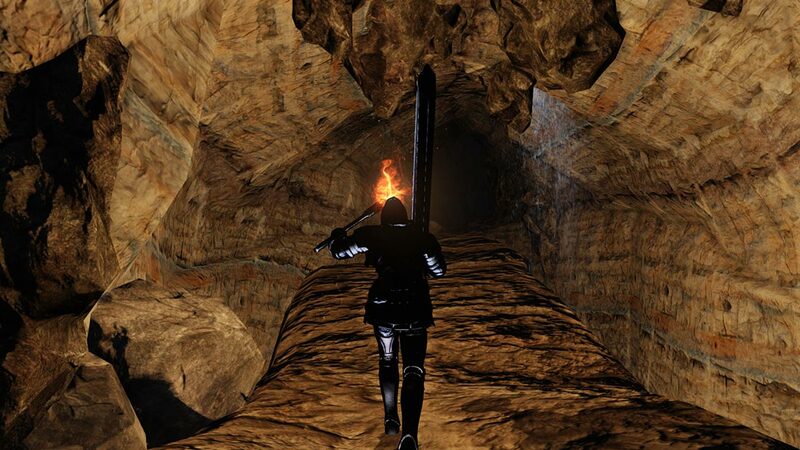 Welcome to See Drangleic, an episodic playthrough journal exploring the world of Dark Souls II. Be sure to check out the introduction post first if you haven’t already, otherwise continue reading for Part 20 which explores Dark Chasm of Old. The Dark Chasm of Old is a secret location in Dark Souls II that is only reachable by devotees of the Pilgrims of Dark. This covenant demands that its members find three hidden portals located in different areas of Drangleic with the final one being found in the bowels of the castle we visited in the previous episode. Whilst locating these special sites is easily done with a strategy guide in hand, navigating the treacherous zone they lead to is another matter entirely. The chasm is pitch-black, so those without a torch or the Cast Light sorcery will quickly run afoul of concealed pits and gangs of hostile phantoms. If you want to see a location where the lighting mechanics reach their most vital implementation, then Dark Chasm of Old may well be the place for you. Carrying a light source is always a tactical concern here and without a torch players won’t be able to interact with the special cauldrons which reveal the exit door once ignited. It’s thematic design too when you consider the hinted connection between this place and the The Abyss from Dark Souls, though it has led to an area looks extremely bland. You aren’t going to see many unique enemies here either and the ones that you do see are the familiar flat shaded character models that possess weapons and armour derived from the game’s existing asset pool. Dark Chasm of Old is also quite difficult. The phantoms dwelling within all hit hard and aggro easily with their numbers split up into complimentary disciplines including at least one spellcaster and a variety of different melee-driven attackers. Adding to the challenge is a complete lack of cooperative functionality with a player’s instance slots being reserved for red phantom invaders only. If the area itself wasn’t so hard to access, you may at one time have expected to see multiple invasions in this place at once with the unluckiest scenario pitting you in a 3v1 scenario against other skilled players. Yikes! Fortunately all enemies are considered hostile to each other in this forsaken place meaning that invaders can’t rely on help from the native enemies like they usually could. An invader only needs to kill one other player in order to claim their prize too, so you can see where the idea was going in trying to create these chaotic brawls where everyone around you is dangerous. In a way this design mentality acts as a prototype for the more successful Mound-Maker covenant from Dark Souls III where the purple phantoms can choose to ally with or attack any player they choose at any time. The problem with Dark Chasm of Old is that the area is too dull and lifeless to be an interesting spot for duels and even then the inconvenience in reaching it only encourages invaders to look elsewhere for their jollies. Pilgrims who reach the third exit door will have a surprise waiting for them on the other side in the form of Darklurker; the official boss of this location and the final test for covenant members looking to maximize their rank. Darklurker is a good boss whose challenge level and overall design seems well considered. In an attack formation reminiscent of the Four Kings from Dark Souls, this winged creature assaults players with rays of dark magic before eventually splitting itself into two separate entities to achieve twice the firepower. Players who haven’t cultivated a resistance to dark damage will find this battle enormously difficult as the potential for things to spiral out of control during the second phase is high indeed. Catching both copies of Darklurker in a single swing is an excellent way of depleting their shared health bar though, so there certainly are strategies that can give you the edge against what is otherwise a very intimidating style of offence. Everything about the music and character design here is solid and the steep difficulty is weighed accordingly with its status as an optional boss (who are historically the franchise’s hardest foes). There is only one real downer about all of this and unfortunately it’s a big one: the run back to the boss is the most arduous of any such run in the vanilla game. Lengthy treks from bonfires back to boss doors is one of the niggles of this series that, for the most part, Dark Souls II went a good way towards softening. This is not the case here because a returning player needs to sacrifice a humanity item to reopen the portal before traversing their final section of the Dark Chasm of Old all over again. Players can’t bypass the regular enemies because of the exit conditions and that padded runtime presents an opportunity to any invaders who might be operating in the area. It’s unforgiving design even by franchise standards. 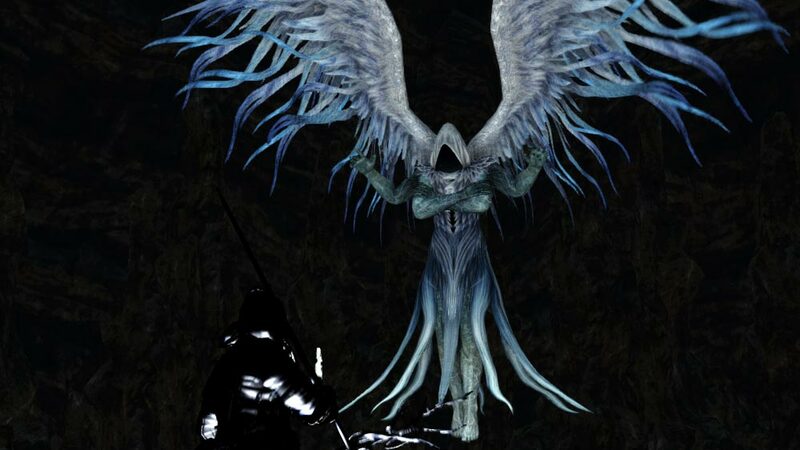 This thoroughly unpleasant run-up is what will ensure Darklurker a tarnished legacy, which is a shame because otherwise I feel it’s one of the better bosses in Dark Souls II and one that a lot of players will probably never get a chance to appreciate to its fullest extent.